IDW Publishing has announced that G.I. Joe: A Real American Hero #247 has sold out at the distributor level, its fourth consecutive issue to sell out. The new Snake Eyes, Dawn Moreno, continues to pull in new readers. The issue was written by Larry Hama, with art by Netho Diaz. It tells the ongoing saga of Dawn, who stars in this “Dawn of the Arashikage” arc, which began last issue with #246. Dawn Moreno, who debuted in G.I. Joe: A Real American Hero #226, was once a gifted high school athlete whose unique physical abilities drew the attention of Cobra Commander. The Cobra elite put Dawn under intense experimentation, accidentally implanting the memories of the original (and now deceased) Snake Eyes into Dawn’s fragile teenage mind. Now, as a haunted Dawn struggles against visions of a dark past that does not truly belong to her, Snake Eyes’ longtime ninja comrades from the Arashikage Clan have joined together to help Dawn overcome the waking nightmare her young life has become. Issue #247 is on sale while supplies last, as well as digitally. 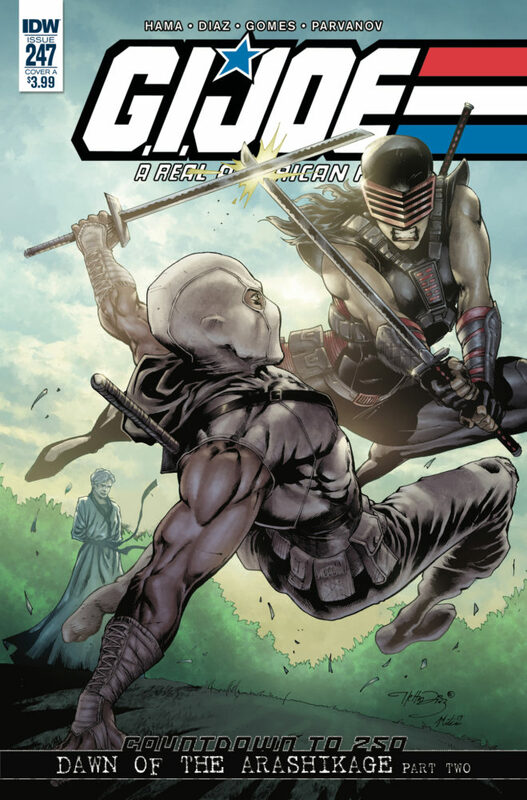 A second printing of issue #246 is also now available to pick up which kicks off this story in the lead up to the oversized milestone issue #250 which concludes the “Dawn of the Arashikage” arc.